Remember Ghosts'n Goblins? It was a highly popular platform game in the 80s released for video arcades and later on home platforms like the C-64, Amiga or Nintendo Entertainment System. 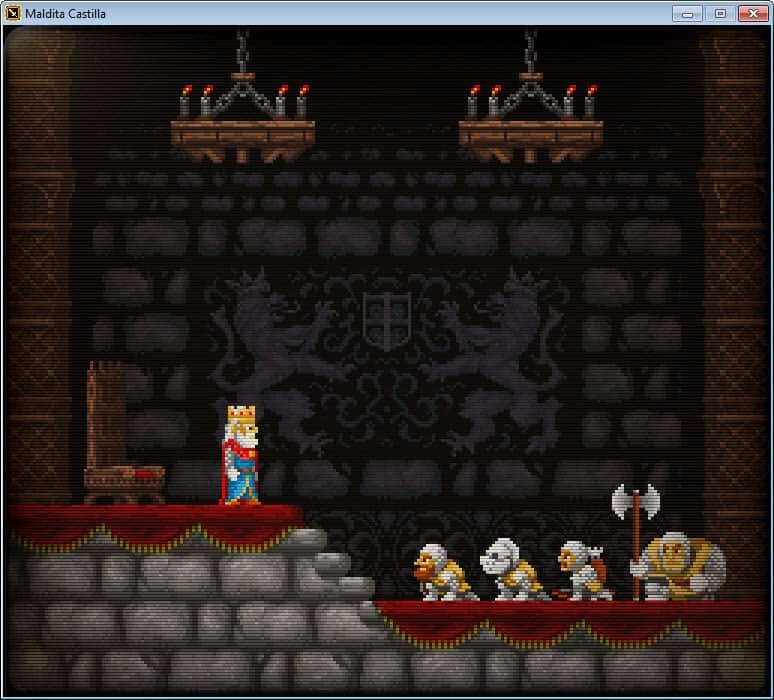 The player controls Sir Arthur in the game who has to defeat all kinds of monsters to rescue a captured princess. 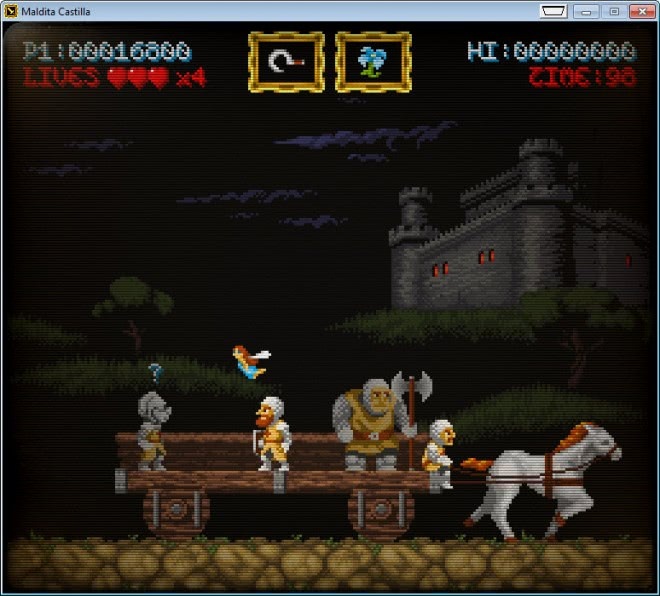 Maldita Castilla is a homage to that game and other games of its type. You play Don Ramiro in his quest to expel the evil that entered the kingdom of Castile. To do that, you need to make it through six levels that become harder with every passing minute, 14 different bosses and a total of more than 40 enemy types. The game begins with a short intro sequence that highlights the quality of it. While you can't compare it to multi-million Dollar rendering intros it is nice to watch and puts you in the right mood to get started. The king orders you to expel the evil and shortly thereafter you start with throwing daggers in the country side. I recommend you change the keyboard layout which you can do in the settings. If you do not, you use the cursor keys to move left and right, go up and down / duck, the z key to fire the primary weapon and x to jump. The first level acts as an introduction to game mechanics. You face zombies mostly that terrorize a village and face off against the first boss, the beheaded knight. While he is not too hard to beat provided that you get your timing right, it marks the beginning of an ever increasing difficulty level. If you beat the knight you are taken to the next level where you find yourself riding on a wagon with other knights. Harpies and goblins attack from the sky and to make it a really unpleasant experience, a giant eagle shows up attacking you in the end. What makes this sequence problematic is that you die when you fall off the wagon and the eagle's attack is destined to do just that. 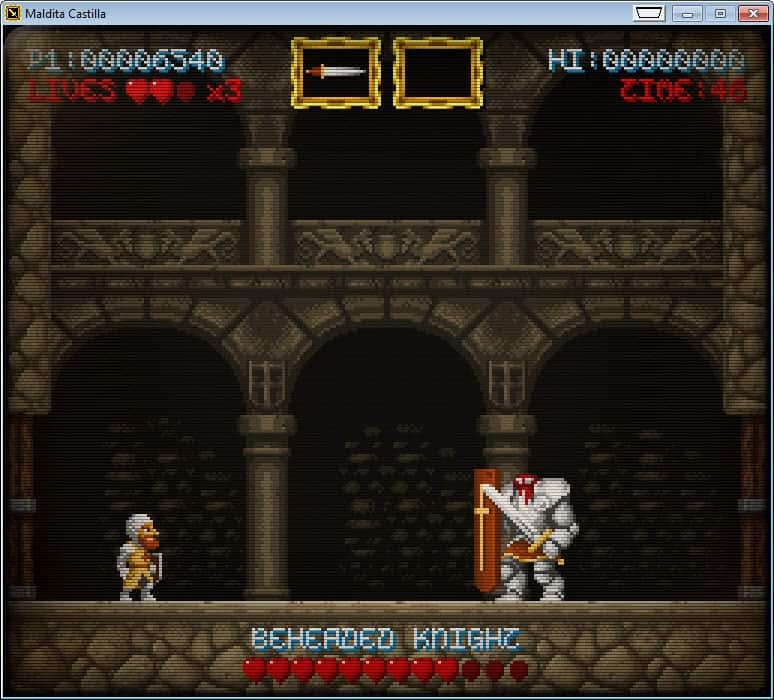 The game is as forgiving as Ghosts'n'Goblins which means not at all basically. You do get three hearts per life which is one more than you got in the original game, and the frequency in which you find hearts and extra lives may also be reassuring that you will make your way through all levels, bosses and monsters for king and country. You find different weapons and items along the way that may help you in your quest. While you lose them again when you die, they may help you tremendously or slow you down depending on what they are. The axe that you get for instance is thrown in an arc which makes it somewhat difficult to hit targets that spawn from the earth. The best weapon in the first levels that you can get your hands on seems to be the hook like weapon that comes back when you throw it. It is fast and easily controllable. If you wait long enough you will notice that weapons change so that you can pick the one you want to play with (whatever you do, do not pick the axe). As far as items go, you sometimes pick up a fairy that helps you in your fights, a shield that protects you from a single hit so that you do not lose a precious heart, or time bonus. Yes, there is a time limit in the game and while I never ran into issues here, it may put additional pressure on you depending on your play style. You do get continues when you lose all your life so you should be able to make it all the way through to the final boss. Did I mention secrets and other goodies you can find along the way and the four different endings the game has? This is a play through video so do not watch it till the end if you want to play the game on your own. The first couple of minutes should give you a solid impression of the game's quality both graphics and sounds wise. If you like platform games of old then this game should definitely be right up your alley. It is fun to play and diverse when it comes to monsters and bosses that you face along the way. Highly recommended.